June 29th, 2008: We’re baaack! And the temperature is hitting 30°. We had air conditioning installed while we were away, and it feels wonderful! 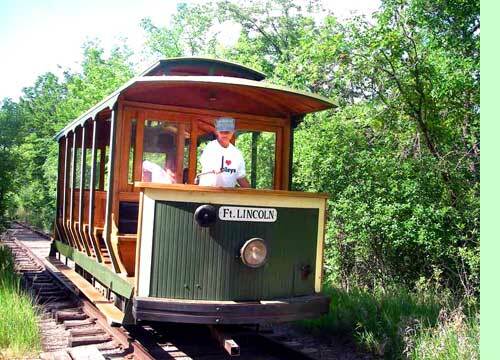 We took the trolley ride Monday, from Mandan out to Abraham Lincoln State Park. It was actually an eight-seat, two-ended, open tram on railroad trucks, on standard-gauge tracks that did considerable wandering around. It was driven by a gas or diesel engine, with controls at the front and back so it didn’t have to be turned. It was run by a very pleasant and helpful operator who let us take Freckles with us. There is also a real retired streetcar that started out life as a horse-drawn tram and was later converted to electricity and used in Bismarck, hauling passengers from the railway station to the State House. It had been converted to gas or diesel and was used on busy weekends when the tram couldn’t keep up. Unfortunately, we didn’t get to ride it. 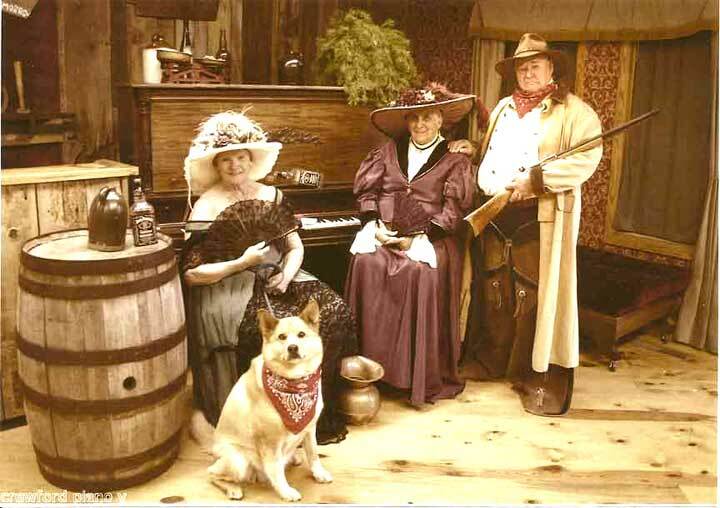 When we got to the park, Cathy and Freckles went one direction to see the house that General Custer once lived in, and Doreen and I visited the Mandan village. Five out of about seventy five of the earth-covered domes that made up the village had been reconstructed and we were amazed at what wonderful buildings they were. Constructed by the women of the group, except for the heavier logs which the men harvested and placed, the logs were covered by reeds and willows and a thick layer of earth. Some old photos of family groups show many people standing on the structures. It seemed to us they were ideal for their climate - cool in the summer and easy to heat in the winter. That village was reported to have thrived for two hundred years. When they weren’t building houses, the women farmed and gathered and the men hunted. On Tuesday, we started toward Minot, with a stop at Washburn to visit the Lewis and Clark Interpretive Center. We also saw Fort Mandan, where the Lewis and Clark expedition spent a winter. 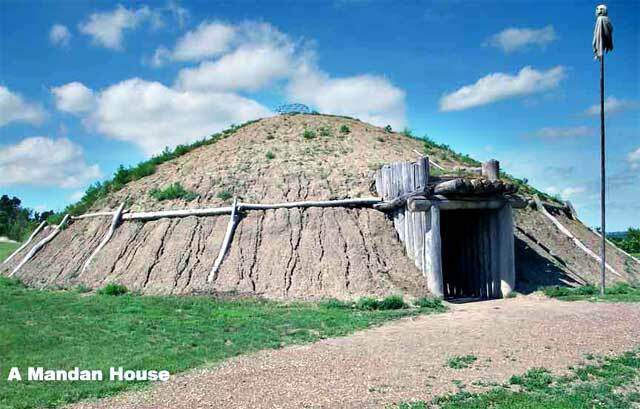 It is a very small fort, well-protected, and accommodated forty-four men and three women. The blacksmith was the most important person, as he made and sharpened weapons for the Indians all winter in exchange for corn and other foodstuffs. The expedition headed on west to the Pacific Ocean in the spring, and when they returned, they found the fort “accidentally burned”. When we got to Minot and checked in at the KOA Kampground, the lady in charge warned us of severe thunderstorm and tornado warnings for the area. Not that we had any options – there was nowhere we could go that would be any safer – but she warned us if it got bad to take refuge in the Laundromat as there is no place less safe than an RV in a bad storm. 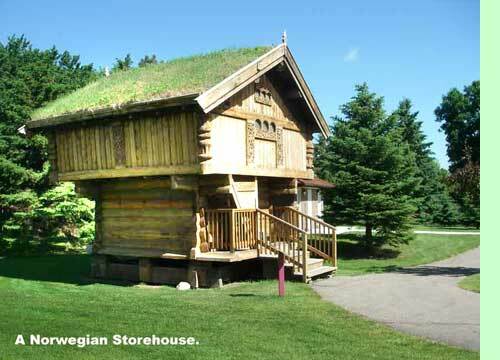 The highlight at Minot was a tour of the Scandinavian Village. 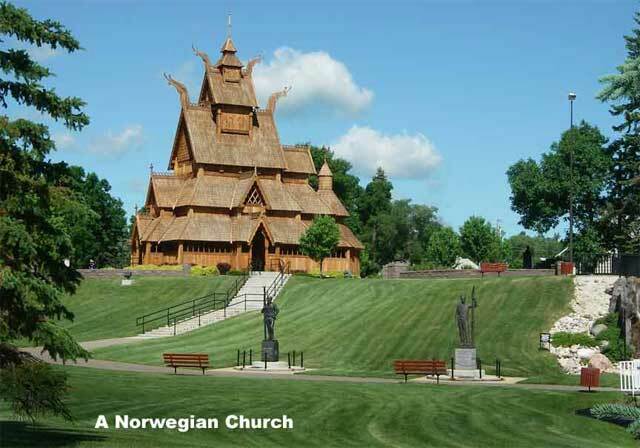 Beautifully laid out and compact, it had a typical house, which was severely plain, a storehouse, which was elaborately decorated, and a Norwegian church, which was fantastic. Carefully fitted together with no nails or glue, it was put together with pegs to allow for flexibility through the changing seasons. 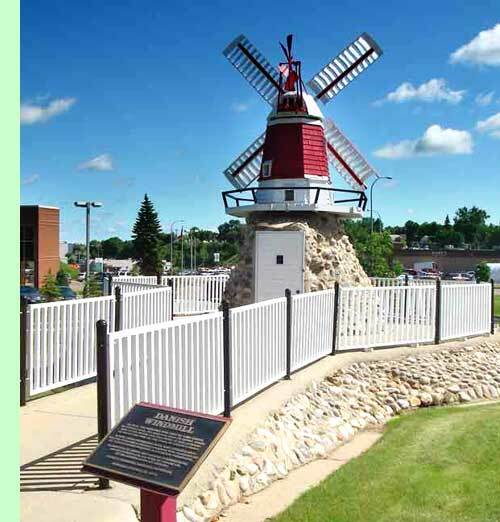 There was a Finnish sauna, and a Danish windmill, plus sculptures of Hans Christian Andersen, Leif Eiricksen, and the man credited with being the father of modern skiing. Cathy left before we got up on Thursday, hoping for a visit with her granddaughter, Daygan Scheidt, in Regina. Daygan lives in BC and was flying back on Friday. We left at a more civilised time, a couple of hours later. Of all the highways we travelled during our tour, #39 from Estevan to Milestone was the busiest and, at times, the roughest. After all the nice weather we had, Friday was cool with a very strong headwind, and it rained almost all the way to Saskatoon. We travelled 3,000 kilometers, had a wonderful time, and it’s great to be home again. When we got home there was a message from Betty Roller on our phone – her sister, Helen Lorenz of Wynyard had died on June 13th after a short illness. We spent a lot of time with Helen and Betty on our bus tour last winter, and Helen had been a friend for many years. Sincere condolences to Betty, and to Helen’s family.